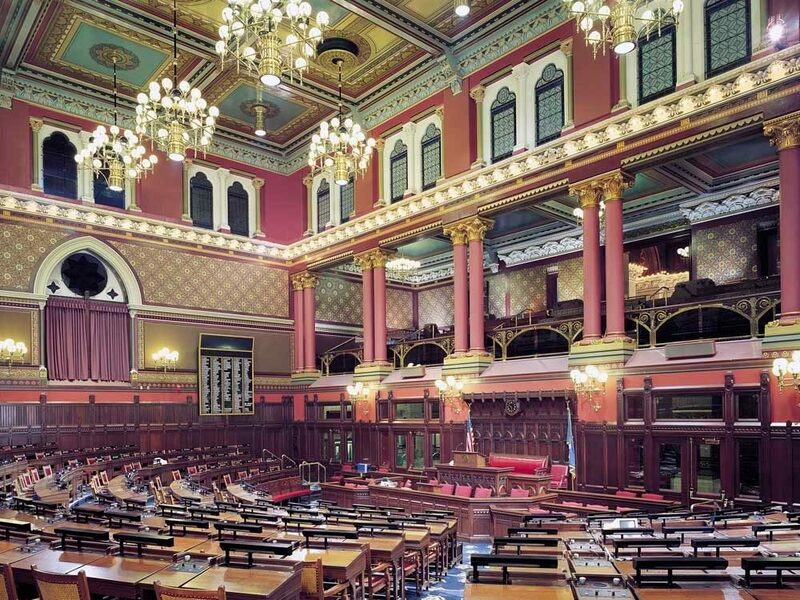 Restoring the Connecticut House of Representatives | John Canning & Co.
Perhaps of all the spaces John Canning & Co worked on in the Capitol building, none was transformed quite as dramatically as the House of Representatives. After careful assessment of the various artistic aspects within the chamber, it become evident that a total floor-to-ceiling restoration needed to be conducted. Over the decades, numerous changes, alterations and renovations were made to the space, each greatly altering the historic vision, making it a challenge to restore the room to its original condition. 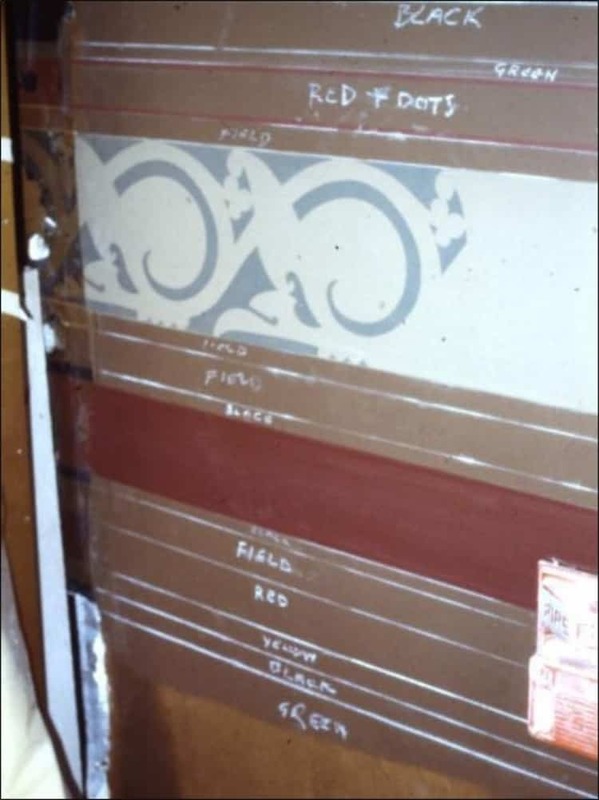 Before restoration could begin, careful analysis was done on a variety of surfaces throughout the space to help provide clues about what the room would have looked like when it was initially completed in the late 1880’s by McPherson. 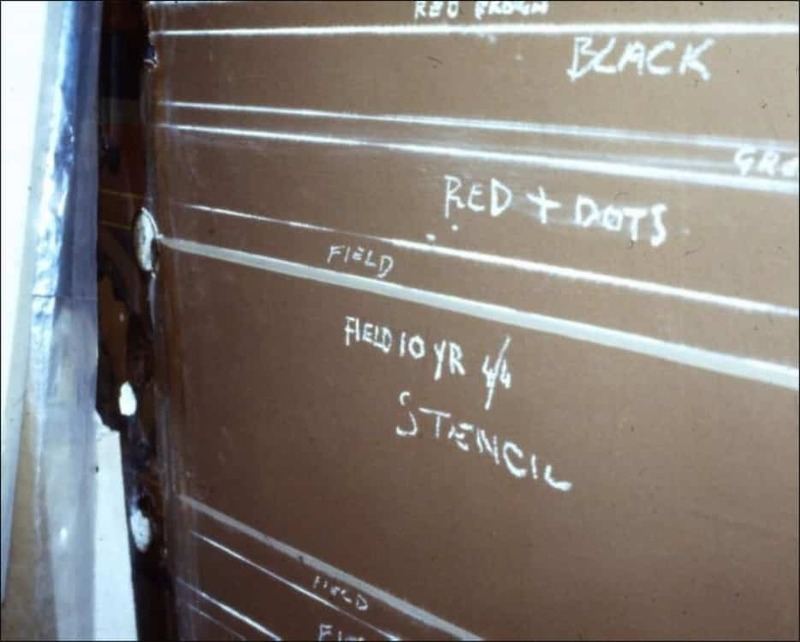 A number of chemical and mechanical tests were employed to help provide information pertaining to original colors used, chemical composition of paints, and the current state of preservation of materials within the House. Working with Professor Frank Matero of Columbia University, microscopy analysis identified 32 original colors which were custom color matched for the restoration. This attention to detail provided the historical integrity the preservation committee was seeking. uncovered the original design—no small feat! 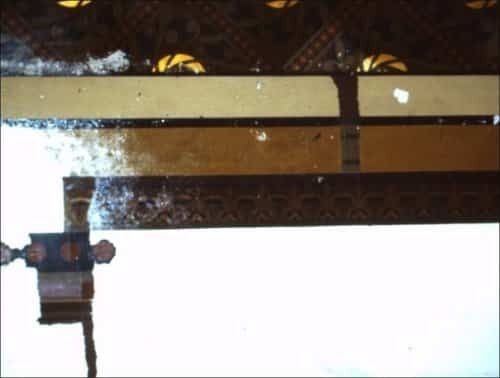 While the ceiling has about 90% of the original stencil patterns, during the restoration additional highlighting of the stencil borders further accentuated the designs and enhance visibility from the chamber floor. 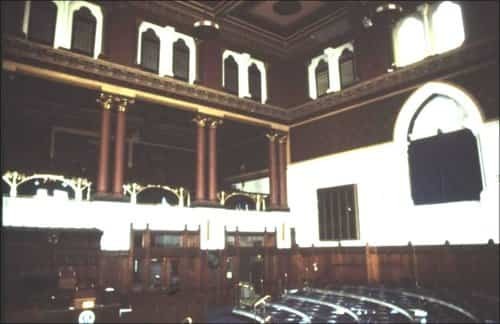 Extensive work was needed to restore the walls of the House Chamber back to its original condition. 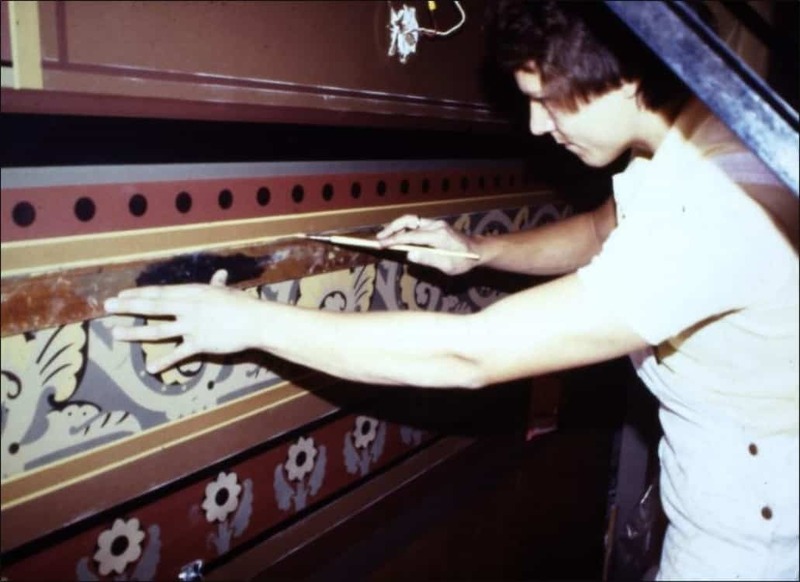 During the late 1950’s the lower portion of the chamber walls were covered in acoustic tiles. Over the years, these tiles were painted over many times, eliminating any noise-dampening properties they may have possessed. When the decision was made to have them removed, the walls incurred due to a strong epoxy applied during the installation process. The epoxy was applied in four spots on the perimeter of the tiles to affix them to the wall. 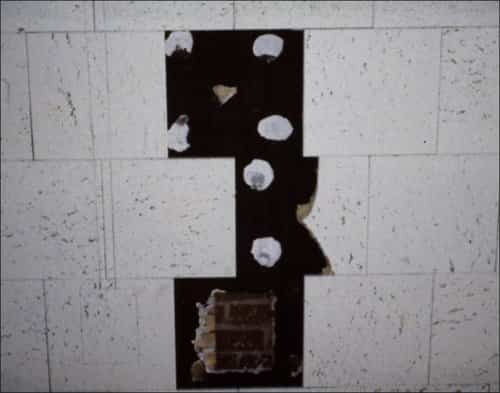 When the tiles were removed, the wall (and stencil pattern) came with it. The damaged incurred resulted in resurfacing the walls, a time consuming process, but one that would make the rest of the restoration work easier. 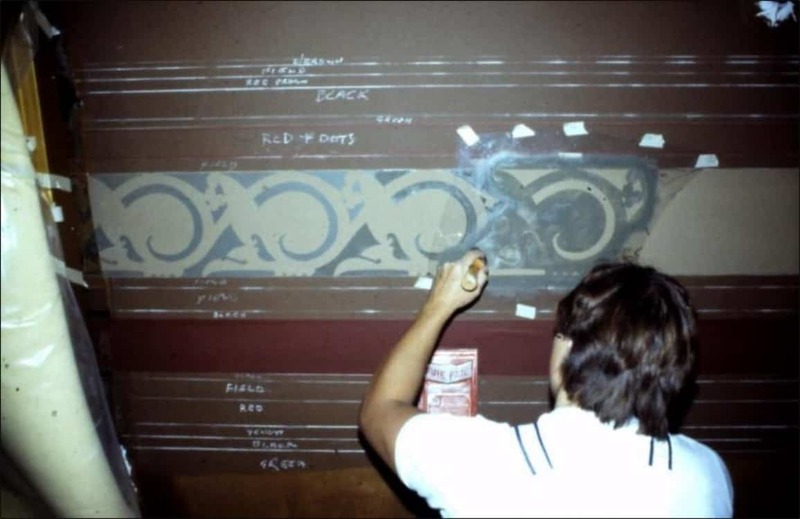 Identifying the original stencil decorations was a complex process. The acoustic tiles covered almost the entirety of the lower walls of the House. However, some exploratory work helped uncover glimpses of the original decoration. On the pillars against the north wall of the observation gallery, several small areas were not covered by tile and enough of McPherson’s original design was still visible to make an accurate replication. 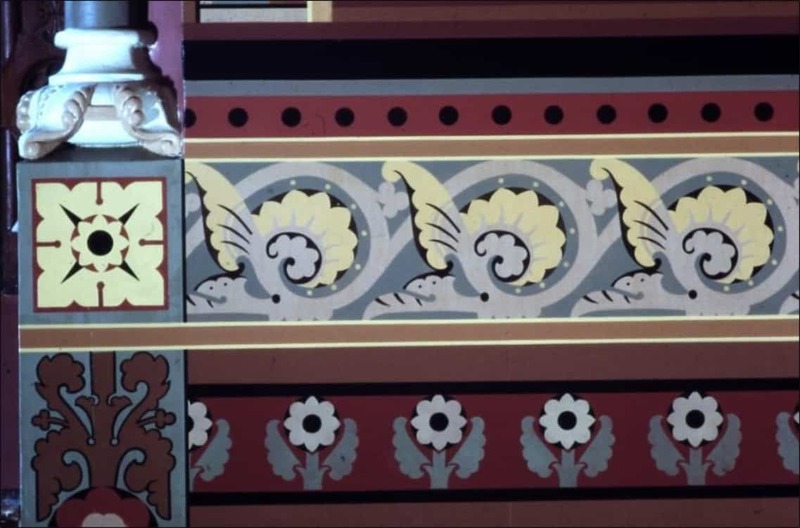 The original design of the walls contained intricate painting and stencil work. To best match the decoration of the room, the same methods McPherson and his artisans would have used were implemented. A method known as striping replicated the series of borders McPherson incorporated into his designs. When striping, a talented artisan is able to make long, straight lines without any raised edges, drips or fuzzy lines. This is achieved by using a beveled striping edge and rigid striping brush. The painter makes quick movements along the striping stick, with the beveled side facing inward. This prevents the paint from building up, dripping or bleeding, and produces a clean, straight line. By utilizing themes already seen within the Capitol, John and his team were able to overcome a number of stylistic challenges. Moreover, through the work of extensive historic and physical analysis, a cohesive and historically accurate vision was achieved. Despite working with very limited design information, the accuracy of the completed project would make McPherson proud.